1. Any failed Religion course must be repeated during the summer as an independent study course. 2. All freshmen must choose course 110...all sophomores must choose course 120...all juniors must choose course 130...all seniors must choose course 140. 3. All students are required to take a Religion Course each year. 4. Each week all religion classes read and reflect on the upcoming Sunday readings. This course is required of all 7th grade students. The curriculum looks at a variety of different topics to introduce the student to the manner in which Jesus Christ affects our daily life. The course work includes units on personal growth and development; respect for life and catholic Christian sexuality; responsibility to others; the identity and mission of Jesus; the role of the Christian community; and our call to discipleship. This course is required of all 8th grade students. The curriculum treats many of the topics from seventh grade in greater depth and detail, and also includes units concentrating on Catholic values; the challenge to grow in age, wisdom and grace; the history of the Catholic Church; the importance of prayer in the life of the individual and the Church; the mission of the Catholic Church to spread the gospel message throughout the world. This course is required of all freshmen. It is a course in Catholic Christianity with an emphasis on the sacramental life of the church. The course endeavors to help the student experience a personal relationship with Jesus through the sacraments. The topics presented cover faith, and faith formation, Catholic Tradition, Sacraments and Spirituality. This course is required for all sophomores. The first semester covers moral decision-making as well as topics such as courage, honesty, respect for people, compassion, respect for creation, reverence for human life, and peacemaking. The second semester presents Catholic social teaching and how it is put into practice. Topics such as building community, celebrating unity amid diversity, working with dignity, breaking the cycle of poverty, and sharing God's Good News are presented and discussed. This course is required for all juniors. The course covers both the Old and the New Testament. Old Testament emphasis is on the laws, the prophets, and the sacred writings. New Testament emphasis is on the Gospel accounts of the infancy narratives, the parables, the miracles, and the passion/death/resurrection of Jesus. In this course, the students will learn the meaning of teamwork through actual experience. The students will learn to use more effective styles of communication as they work with other students throughout the school. This course is intended to develop leadership skills through a better understanding of the characteristics of positive human relationships. A portfolio writing program is in place for all grade levels. English 7 is designed to develop reading skills and a basic understanding of literary terms. This course continues the development of English skills, writing skills and study techniques as well as preparation for the New York State Common Core ELA 7 test. Students take a local exam at the conclusion of the course. English 8 is designed to develop skills in the areas of reading, thinking, listening, speaking, writing, and research. In addition, students are prepared for the New York State Common Core ELA 8 test. The New York State ELA 8 Test is required of all students. Students take a local exam at the conclusion of the course. English 9 is designed to develop skill in the areas of reading, thinking, listening, speaking, writing, and research. The course emphasizes study skills and preparation for the New York State Common Core English Regents exam. Students take a local exam at the conclusion of the course. English 10 is designed to teach the analysis of literature. The course reinforces English skills and study skills as well as continues the preparation for the New York State Common Core English Regents exam. Students take a local exam at the conclusion of the course. English 11 is designed to focus on the analysis of American literature. The course reinforces English and study skills. The New York State Regents Exam in English Language Arts 11 will be administered to all students. This course is designed for those students who possess both a strong interest and skills in English Language Arts. It is designed to be more rigorous than English 11 and is writing, independent reading, and discussion intensive. English 11 Honors will also serve as a strong preparation for those planning to take AP English in senior year. The New York State Regents Exam in English Language Arts 11 will be administered to all students. PREREQUISITE: grade of 90 or better in English 9 & 10, a cumulative GPA of 85% and a teacher recommendation is required. English 12 is designed to focus on the analysis of English literature. The course helps students practice and refine their English and study skills. Students take a local exam at the conclusion of this course. Advanced Placement English is a college level course and is designed for the student who enjoys reading, discussing, and writing about literature on an advanced level. The course also is designed to prepare the student for the College Board AP Exam that all enrollees in the course are required to take and for which there is a fee. Students take a local exam at the conclusion of the course. PREREQUISITE: Cumulative English average of 90 (grades 9-11), a cumulative GPA of 85%, 11th grade teacher recommendation and personal interview with AP English teacher. This course of study examines United States history in a chronologically arranged fashion. Major political, social, and economic topics from the pre-Columbian era to the Civil War Era are covered. The course of study involves the use of maps, charts, graphs as well as written expression. This course follows the implementation of New York State's changes to scope and sequence for topics and assessment. This course of study concludes the Unites States history that was begun in seventh grade. Topics covered begin with the post-Civil War Era and end with current day topics. As with seventh grade course work, maps, charts, graphs as well as written expression are used. This course follows the implementation of New York State's changes to scope and sequence for topics and assessment. The program for grades nine and ten is a two-year world history course organized chronologically. Grade nine will include units beginning with the Stone Age and ending with the Scientific Revolution and Enlightenment. The curriculum includes geographic and historical settings, cultural and economic development and global relationships. The course of study involves analysis of primary source documents leading to written expression. Purchase of a review book will be required. The program for grades nine and ten is a two-year world history course organized chronologically. Grade ten will include units beginning with the French Revolution and ending with present day history. The curriculum includes geographic and historical settings, cultural and economic development, global relationships, contemporary nations, and the impact of religions on society. The Global History & Geography Regents will be given to all students. Purchase of a review book will be required. This course chronologically examines United States history. Major emphasis is placed on Constitutional issues as well as on the United States in its role as a major industrial nation and world power. Key domestic and foreign events and policies are examined and analyzed through primary source documents. The United States History & Government Regents will be given to all students. Purchase of a review book is required. This course will examine the history of the human experience from the Neolithic Revolution to current times. Global perspectives with emphasis on the global processes and patterns will be discussed and evaluated through the critical analysis of historical primary source materials and student research. The acquisition of historical fact and proficiency in writing high quality essays will be the objective of this course. APWH is a challenging college-level course that will prepare exceptional sophomores for the APWH exam in May (which all students are required to take and for which a fee is charged) and the Global Regents in June. Motivated seniors may choose this course as an elective. PREREQUISITE: an average of 90% or better on tests, essay scores, midterm and final grade in Global 9 and an overall cumulative GPA of 85%. This study of U.S. History and Government is designed as a college level course and as such, is highly challenging and requires extensive reading, writing, and discussion. The course will chronologically examine major themes in American history and will analyze conflicting positions through historical readings and student research. The acquisition of historical facts and proficiency in writing high quality college level essays will be objectives for the course. This course is designed to prepare the student for both the AP American History exam in May (which all students are required to take and for which a fee is charged) as well as the New York State Regents Exam in U.S. History and Government in June. Purchase of a review book is required. PREREQUISITE: grade of 90 or better on tests, essays, mid-term, and final exam in Global History and Geography Regents Exam, a cumulative average of 90% in Global History 9&10, overall cumulative GPA of 85% and a teacher recommendation. Placement by transfer students may involve a placement test. This semester course in economics is intended to meet the mandate of the New York State Board Of Regents. It is designed to provide students with the economic knowledge and skills that will enable them to function as informed and economically literate citizens in our society and in the world. The emphasis on rational decision-making in economic areas will encourage students to become wiser consumers as well as better citizens. Required of all seniors for graduation. This course is designed to give the students a greater understanding of the foundations of the American political system, the Constitution, and the day-to-day operation of the government bureaucracy. Its purpose is to prepare students to become informed citizens who are ready to take an active role in the operation of government on all levels and who also understand the way America’s government compares or contrasts to the governments of other nations. This fulfills NYS Government requirement for all seniors for graduation. This course is designed to give students an overview of government and politics in the United States. Students will be involved in the study of general concepts as well as various institutions, groups, beliefs, and ideals that make up the American government and political process. Students will take a local exam at the conclusion of the course. Students will receive 3 college credits through MVCC only if they successfully complete the course. PREREQUISITE: Grade of 85% or better on the US History Regents, a cumulative average of 85% in Global 9,10 & US History, and a recommendation from the US History teacher. This fulfills NYS Government requirement for all seniors for graduation. The AP Psychology course is designed as an introductory college course and will be highly demanding. The course will introduce students to the systematic and scientific study of the behavior and mental processes of human beings and other animals. Students are exposed to the psychological facts, principles, and phenomena associated with each of the major subfields within psychology. They also learn about the ethics and methods psychologists use in their science and practice. This course is designed to prepare the student for the AP Psychology exam in May (which all students are required to take and for which a fee is charged). PREREQUISITE: grade of 90 or better on both the Global History and Geography Regents Exam and the US History and Government Regents Exam, a cumulative average of 90% in Global History 9&10 and US History and Government 11, as well as a teacher recommendation. Students should also be willing to accept the demands of a rigorous curriculum that includes outside readings, essay writing, and research projects. This is an elective course. This course is designed to give students an overview of psychology as a science of animal and human behavior and experience. Topics to be covered include the history of psychology, human development, learning and memory, theories of personality, abnormal behavior and forms of therapy. This is an elective course. This course introduces the student to the nature of culture and of human society, as well as the structure and functions of social organizations. The course illustrates how the groups, or social structures that one belongs to, have a profound influence on the way one thinks, feels, and acts. Sociology looks at groups rather than individuals. Major themes include deviance and social control, inequalities of gender and age, family and marriage, education, political and economic institutions, religion, and sport. Students will be expected to participate in class discussions, complete projects and essay assignments, and complete all class readings. This is an elective course. CALCULATORS: Notre Dame High School supports the New York State Education Department Policy regarding the use of Graphing Calculators in Mathematics: “The graphing calculator should be used for all types of classroom activities and homework as an integral part of the three Regents-approved commencement level mathematics courses, Integrated Algebra, Geometry, and Algebra3/Trigonometry. A graphing calculator must be made available for use by each student while taking the corresponding Regents Examination.” To this end, the Notre Dame Math Department recommends the purchase of Texas Instruments model TI- 83+ graphing calculator as this is the model that will be used for instruction in class. As New York State implements Core Curriculum Standards, content of Notre Dame math courses will reflect this change. Math 7 will cover mathematical strategies to improve students' problem solving skills. Topics covered include an introduction to number concepts (order of operations, number properties), Algebra (using equations, variables), Geometry (reading x, y coordinates, area of figures, geometric constructions) Probability and Statistics (mean, median, mode), Ratio, Proportion, and Percent. Students will take the New York State Common Core Math Test for Grade 7. This course serves two purposes: 1) to prepare students to successfully take the New York State Common Core 8th grade Math Assessment and 2) to give students the foundation needed to succeed in the high school math curriculum. Topics covered include operations on integers and rational numbers, ratios and proportions and percents, variables, solving equations and inequalities, applying algebraic principals to simple geometric and trigonometric problems. This course is the first of three in New York State's new Common Core Math courses. Topics covered include: the real number system, quantities, seeing structure in expressions, arithmetic with polynomials and rational expressions, creating equations, reasoning with equations and inequalities, interpreting functions, building functions, linear/quadratic/exponential models, and interpreting categorical and quantitative data. Successful completion of this course and June NYS CCLS mathematics Regents exam is required for graduation. This course is designed for the student who requires two years to cover the material for the required entry-level Common Core Regents math course. The first half of the CCLS Regents curriculum will be covered. This course covers the second half of the required entry-level Algebra 1 (Common Core) Regents math course. Successful completion of this course and June NYS CCLS mathematics Regents exam is required for graduation. Uses Common Core Mathematical Practices: 1. Make sense of problems and persevere in solving them. 2. Reasons abstractly and quantitatively. 3. Construct viable arguments and critique the reasoning of others. 4. Model with mathematics. 5. Use appropriate tools strategically. 6. Attend to precision. 7. Look for and make use of structure. 8. Look for and express regularity in repeated reasoning. Practices applied to concepts of: congruence, similarity, transformations, proof, right triangles, trigonometry, circles, expressing geometric properties with equations, geometric measurement and dimension, and geometric modeling. All students are required to take the New York State Common Core Geometry Regents. This course will introduce students to geometric and trigonometric concepts that are included on standardized exams and college placement tests. Emphasis will be on conceptual understanding and reasoning while the formal rigorous proofs of the regents’ curriculum will be de-emphasized. New Common Core aligned course will continue to develop Common Core Mathematical Practices as applied to polynomial, rational and radical relationships; trigonometric functions; modeling using functions; and inferences and conclusions from data. Major emphasis is on the examination of number systems of elementary math and the study of elementary functions. Topics covered include: real and complex number systems, vectors, polar coordinates and graphing, the derivative and quadratics. First semester review of math topics covered in MVCC MA 090 in preparation for college placement math test, which students will take at the end of the first semester. Those who qualify will take MVCC MA 110 the second semester for both high school and college credit. Students must earn an C to get college credit. This course is designed for a student completing the three course Regents sequence in math who is not likely to need to take Calculus at the college level but will need Statistics for their major. In semester one: exponents, radicals, polynomial expressions, functions/relations and their graphs, inequalities, and systems of linear equations will be covered. In semester two: graphs/tables, frequency distributions, measures of central tendency and dispersion, standard normal distribution, correlation, regression, probability, and inferential statistics will be covered. Students must pass MVCC placement test to enroll. To receive MVCC credit requires a C average and passing grade on MVCC final exam. This course is equivalent to a basic college freshman course in Calculus. It is required that all students enrolled in this course take the national AP Calculus Exam in May that may result in college credit dependent upon the college’s policy and a student's score. There is a fee for the AP exam. This course is an introduction to Regents Biology. Students will study the life processes of all living things from the simple to the most complex. They will become familiar with body systems, life cycles, and how organisms interrelate. This course is a study of health issues relating to junior high age students. It includes issues such as disease prevention and AIDS, as well as issues related to puberty, self esteem, decision making, personal hygiene, and drugs. The Physical Setting is an introductory course for chemistry and physics. Topics covered include: matter, forces, waves, work and machines, energy, chemical and physical change, atoms, elements, and compounds. This course in Earth Science covers the following areas of study: rocks and minerals, astronomy, Earth’s dynamic crust, natural disasters, weather, and humanity’s impact on a changing planet as presented in the New York State Core curriculum. The Regents examination is given to all students. All students must purchase a review book. This course in biology is designed to provide broad general understanding of the fundamental principles of biology covering the following topics: cells, animal and plant biology, human physiology, genetics, ecology, and laboratory techniques. The Regents examination is given to all students. All students must purchase a review book. This course covers the following areas of study: atomic concepts, moles/stoichiometry, chemical bonding, physical behavior of matter, kinetics/equilibrium, organic chemistry, oxidation-reduction, acids-bases-salts, and nuclear chemistry. The Regents examination is given to all students. All students must purchase a review book. This course is designed to cover basic chemistry topics (such as: atomic concepts, chemical bonding, physical behavior of matter, organic chemistry, acid base) to provide a foundation for college chemistry 101, as well as topics that will be helpful in everyday life. This course is designed to blend the investigative approach with the theoretical approach of scientific thought to the areas of Physics. Mechanics, optics, vector analysis, electricity and magnetism, and atomic and nuclear theory are presented. Homework and lab reports are required. PREREQUISITE: Integrated Alg., Geometry, Alg 2/Trig & Chemistry Regents. All students must take the regents exam. All students must purchase a review book. This course is designed to cover basic Physic topics, such as: mechanics, optics, vector analysis, electricity, magnetism. The goal of the class is to provide a solid foundation for college physics, and provide students with tools that will be useful for everyday life. This course will expose students to the historical, chemical, physical, biological, medical and ethical concerns and challenges associated with this new and developing field. The AP Biology course is designed to be the equivalent of a two-semester college introductory course usually taken by biology majors during their first year. The college course in biology differs significantly from the usual first high school course in biology with respects to the kind of textbook used, the range and depth of topics covered, the type of laboratory work done by students, and the time and effort required of students. Topics for AP Biology include molecules and cells, heredity and evolution, and organisms and populations. This course aims to provide students with the conceptual framework, factual knowledge, and analytical skills necessary to deal critically with the rapidly changing science of biology. The students will take the AP Exam at the end of the course for possible college credits. PREREQUISITES: Cumulative average of at least an 85 in both the biology and chemistry regents courses and a mark of at least 85 on the biology and chemistry regents exams and an overall cumulative GPA of 85%. Students will study such topics as nutrition and exercise, dependency-type substances (drugs, alcohol, tobacco), communicable diseases, decision-making and physical hygiene. REQUIRED FOR GRADUATION. The language department strongly recommends that students considering the next level of language study for levels 1 through 3 have a final average of 70 in the preceding level. Students who are marginal in their skill and knowledge mastery will experience difficulty succeeding at the next level. For level 4, a final grade of 80 in level 3 is recommended and for level 5, a final grade of 80 in level 4. This course is designed to provide the 7th grade student with the first portion of Level 1 Spanish which will be completed by the end of grade 8 and will then receive high school credit. Basic vocabulary, grammar, and culture will be studied. Students are expected to learn to read, write, and speak in Spanish and to understand spoken Spanish appropriate for their level. This course will continue the study of Level 1 Spanish. Basic vocabulary, grammar, and culture will be studied. Students are expected to learn to read, write, and speak in Spanish and to understand spoken Spanish appropriate for their Spanish 1 (b). Students must pass this course and the proficiency exam to graduate. Students will continue to work on written, oral, and aural competence with increased emphasis on grammar structure and translation. A continued awareness of the culture of Spanish speaking countries is included. Students will continue to develop skills in reading, listening, translation, and speaking with an added emphasis on composition as well as gain deeper knowledge of the cultural aspects of the Spanish speaking countries. Upon completion of Spanish 3, those students working towards an Advanced Regents diploma will have met the foreign language requirement. Students will be exposed to a more in-depth study of the history, geography and the cultures of the Spanish-speaking world. They will also review grammar structures that have been learned. This course is the equivalent of MVCC 191 & 192 Spanish. The first semester is a strong intensive review of grammar that culminates in the creation of three major projects given throughout the semester. The second semester is highly intensive vocabulary building in each of the skill areas. Students must provide skill evidence of grammar and verb structures in all their creative writing and speaking assignments. It is recommended that students seeking dual credit have a cumulative average of 80 in Spanish 1-3. *Students who receive a final grade of at least a "C" and pass the MVCC final exam will receive 3 college credits for each semester from MVCC. This course allows students to earn both high school and college credit. Students who receive a final grade of at least a “C” and pass the MVCC final exam will receive 6 college credits from MVCC. The aim of this course is to develop proficiency in each of the skill areas – reading, writing, listening, and speaking. Each class, which is conducted entirely in Spanish, will have one or more of these skills as the primary focus. The course is designed in alignment with national standards and the textbook that is used contains a collection of Spanish stories. It is recommended that students seeking dual credit have a cumulative average of 80 in the Spanish 1 – 3 courses and a final grade of 85 in Spanish 4. Students must also be recommended by their Spanish 4 teacher. This course is designed to provide the 7th grade student with the first portion of Level 1 French that will be completed by the end of grade 8 at which point they will earn one high school credit. Basic vocabulary, grammar, and culture will be studied. Students are expected to learn to read, write, and speak in French and to understand spoken French appropriate for their level. This course will continue the study of Level 1 French. Basic vocabulary, grammar, and culture will be studied. Students are expected to learn to read, write, and speak in French and to understand spoken French appropriate for their level. Students must pass the course and the proficiency exam to graduate. Students will continue to work on written and oral abilities, and aural competence with an increased emphasis on grammar, structure and translation. A continued awareness of the culture of the country is included. Students will continue to develop skills in reading, listening, translating, speaking, and composition as well as attain a deeper knowledge of the cultural aspects of the people and country of France. Upon completion of French 3, those students working towards an Advanced Regents diploma will have met the foreign language requirement. This course allows students to earn both high school and college credit. Students who receive a final grade of at least a C and pass the MVCC final exam will receive 6 college credits from MVCC, French 201-202. The aim of this course is to develop proficiency in each of the skill areas: reading, writing, listening, and speaking. Each class, which is conducted entirely in French, will have one or more of these skills as the primary focus. The course is designed in alignment with MVCC standards and the reading units are comprised of a collection of French language short stories. PREREQUISITES: cumulative average of 80 in French; final grade of at least an 80 in French 3. This course allows students to earn both high school and college credit. Students who receive a final grade of at least a C and pass the MVCC final exam will receive 6 college credits from MVCC, French 301-302. This course is intended for those students who have chosen to develop their proficiency in French. Students will be exposed to a more in-depth study of the literature and rich cultures of the French-speaking world. This course offers the higher level vocabulary and grammar that is necessary to communicate in French. Students will read Francophone novels and poems, and will study the art, film, and music of Francophone cultures. Composition, research, and presentations will be included. The primary focus will be to increase the student’s ability to communicate in French with ease and confidence. PREREQUISITE: grade of at least 80% in French 4 and the teacher recommendation. Purpose: To introduce students to the meaning of citizenship, the elements of leadership and the value of scholarship in attaining life goals; promote an awareness of the importance of a healthy lifestyle, including physical fitness, a proper diet and controlling stress; drug awareness; provide the principles of health and first aid, geography, survival skills and an overview of Naval ships and aircraft. These elements are pursued at the fundamental level. Purpose: To build on the general introduction provided in Naval Science 1, to further develop the traits of citizenship and leadership and to introduce cadets to the technical areas of naval science and the role of the U.S. Navy in maritime history and the vital importance of the world's oceans to the continued well-being of the United States. Purpose: To broaden the understanding of students in the operative principles of military leadership, the concept and significance of teamwork, the intrinsic value of good order and discipline in the accomplishment of objectives. They will learn the importance of sea power and national security. Students gain a more in-depth knowledge of Naval ships and aircraft while getting an introduction to marine navigation and seamanship. PREREQUISITE: Naval Science 1 & 2. The intent of this course is to inform you of your various financial responsibilities and to provide you with the knowledge to prepare you for the future. Topics covered include savings, investing, investment alternatives, investment risks and how to invest wisely. You will learn about health insurance; who needs it, why, how it works and types available. You will explore wise buying practices and understanding your rights and your responsibilities as a consumer that protect you. This course will focus on the student's role as a consumer and active member of society. You will better understand your own wants, needs, values and how these affect personal financial decisions. Understanding the concepts presented will help your financial future and make you a more effective consumer. Topics covered will include career development, money management and personal decision making in regards to major purchases, family decisions, goals and dealing with life's uncertainties; divorce, death, retirement planning. The emphasis of this course is on the individual encountering business law in his personal, family, and occupational situations, Topics covered include: court procedure, contract law, buying and selling goods, bailment, insurance, wills and inheritance partnerships, and corporations, and real estate. This course will allow the students to study content related to the ownership/operation of business and the skills of selling, advertising, and market research. The course provides students with skills, which combined with other business skills, can prepare the student for entry level employment in a variety of career clusters within marketing and management. This course will concentrate on computer literacy, word processing, database, and spreadsheet applications and review of keyboarding skills. Students will be exposed to the most recent advances of hardware, software, and online search engines. The first part of our Careers curriculum is integrated within the Computers 7 course. Student discover their work values, interests, skills, aptitudes, and personality types- through the Meyer-Briggs Personality Survey. Additionally, we will address the tenets of digital literacy and citizenship within the themes of cyber-bullying, plagiarism, and safety & security in the digital world, as put forth in the Common Sense Media curriculum. Students will master the preparation of various types of documents using Microsoft Office. They will create PowerPoint presentations utilizing video streaming/downloading and proficient use of the internet for educational research. They will learn to access and utilize information obtained online. They will be taught the ethics of research, and will develop skills intended to create lifelong learners. Through the use of the Common Sense Media Curriculum, students will continue to explore the role of digital media in their lives, and learn how good digital citizens harness these tools responsibly. This course is designed to give students the knowledge needed to maintain, support, and repair computer systems. Students will be taught basic computer networking. 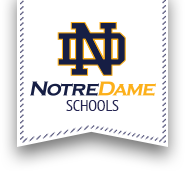 As members of the ND Tech Squad, these students will assist in assuring that the school network and computers are maintained daily and will assist both students and teachers by supporting an informal “help desk.” Admission is by invitation only. Interested students should see the technology teacher within 2 weeks of receipt of the directory. Students will write, speak, create, analyze and perform music through a basic knowledge of musical concepts and terminology. Class activities include listening and responding to a variety of music genres through individual and group projects. Students will increase their understanding of how music connects to other disciplines and its relationship to history and culture. This course will engage students to participate in a performing musical group. Students will learn basic vocal techniques and acquire fundamental skills in music theory, sight singing, and ear training. Dedication and commitment is necessary to develop a high standard of performance and poise. Band 899 Full Year 1 unit Students will work in lessons and in band towards the goal of outstanding performance. Students will establish correct instrumental techniques and strengthen critical listening skills as performers. Musicianship will be developed through good intonation, balance, blend, tone, appropriate style, and quality repertoire. Students will use problem-solving skills to produce projects that explore the concepts of space and structure, movement, and color and light. The introduction of art history through the study of multi-cultural artists will take place using various media. Students will be exposed to images, motifs, symbols, themes: they will identify disciplines in art, such as architecture, design, painting, sculpture, etc. Students will learn the fundamental uses of elements of art and principles of design and will study art movements. The course will include an exposure to a variety of drawing and design exercises in various media. Multi-cultural art projects will also be assigned. This course introduces students to a wide variety of experiences in drawing and painting media. They will review elements of art and principles of design through different materials and techniques. Art history lessons will be incorporated into the curriculum. Students will continue to explore a variety of media and techniques while having more freedom to explore and create projects. Discussion about composition, portfolio preparation, art career exploration, and art schools and colleges will take place, if student is interested in post-secondary study in art and/or requires a portfolio for admission to college. The program provides a flexible curriculum that creates an atmosphere conducive to the growth of motor skills and body management, acceptable social behavior, good sportsmanship, physical fitness, common courtesy and cooperation. Students will be graded on attendance, participation, performance and knowledge of each unit covered. Course will stress various aspects of jogging, conditioning and team sports. Course will also emphasize active participation in team sports. The activities offered will attempt to develop and maintain physical well-being. Students will be graded on attendance, participation, performance, and knowledge of each unit covered. Physical Education failures must be made up in summer school. For seniors, a passing grade is necessary for graduation.